It’s been two weeks since I joined SFI as an affiliate. SFI is active in about 200 different countries and has a large number of affiliates. Tripleclicks is one of their main products where you can make money by selling products of which there are over 90,000 products you can choose from. You can also sell your own stuff as well. You and make a commission from things bought by your customers as well as people you sponsor as an affiliate. Once you join your first task to move up in ranks is to become an Executive Affiliate. This is achieved by accumulating 1500 VersaPoints. These can be earned by doing different things on a to-do-list such as reading articles, doing training, and completing different tasks in setting up your account. You can also purchase different products on a standing order to earn a number of points each month. You must have 1500 points each month to get your share of the pool of earning each month. I am an Executive Affiliate which wasn’t that hard to do. The next objective is to become a Bronze Team Leader. To obtain this you must have a VersaPoint total of 3000 points, 1500 VP from sales and sponsor at least 5 Personal Sponsored Affiliates. When your PSA is an EA2, meaning they’ve earned 1500 VP for the second time you earn a VP match of their VP which increased your earning also. You also earn a 45% commission on anything they purchase from TripleClicks. I’m working on this level at this time. As you can see this is not some get rich quick system, but it can become a great income if you just work at it on a daily basis. 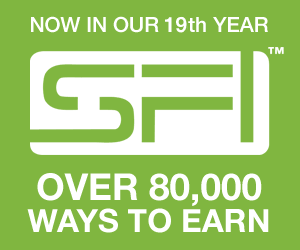 SFI has been around for 18 Years and keeps growing on a daily basis. So if you want a business that pretty easy to do and is going to be around for a long time why not join me in my SFI journey. Join now and get up to $100 sign up bonus.